Today would be my last day in Kayamandi before leaving with Dan for a few weeks to travel about Dubai and Morocco. We didn’t plan anything for today because we still needed to get everything ready for our trip and say our goodbyes. Much earlier than either of us had anticipated we heard a knock at our door. I got up to see who it was and saw Avela standing at our door. I knew he’d be heading back to the Eastern Cape today and that this was him coming by to say farewell. Avela is one of the nicest guys in Kayamandi, and is constantly doing things for others. Initially I didn’t think I’d even be able to see him again due to the fact that he has since moved out of Kayamandi. It was such an awesome surprise to find out that he’d be able to come along on our trip and join the rest of his best friends while we explored their beautiful country. Since this would be the last time I’d be seeing Avela, for probably a very long time, we decided to present him with a few parting gifts. We gave Avela 3 things before saying goodbye. The first thing was his professional picture of him holding a snake at the Wildlife Ranch. The second was the name card drawling I made for him, and the third was a photo album consisting of 35 photos from out trip featuring him. As he paged through the album I noticed tears streaming down his face. I was truly touched that he loved the album so much. It’s moments like these that will stick with me forever and drive me to make a return trip in the future. I never thought I’d care so much for a group of kids, now young adults, so dearly. We’ve become a family in the time we’ve spent together and nobody likes having to say goodbye to the ones they love. After a few hugs, and many thanks, Dan and I walked Avela to our front gate and said our final goodbye. One day, Avela, we’ll meet again. The next significant event for Sunday was a farewell lunch with Hanneke, Mieke, Theresa, and Dan. We all had a few minor things to take care of in Stellenbosch and afterwards strolled over to a restaurant by the name of Simply Asia. I chose this place because of how great I remember it being on my last visit. The girls and I split a sushi platter to start our meal and it was absolutely delicious! Following our appetizer Hanneke and I split a chicken and steak noodle dish. She ordered the dish with chicken, I ordered the same meal with steak, and we split the whole thing 50/50. This worked out so nicely because I was having an internal debate as to which I should order. Our meal was really phenomenal and it was the perfect way to spend our last lunch before departing. We were also celebrating having known each other for 1 month!! Back in Kayamandi a few of the kids had come over and helped me put the finishing touches on the last of our postcards. At this point I think everyone’s postcard has been mailed out. In the next few weeks be sure to keep an eye out for them, and if you receive yours please upload a picture and hashtag it, ReachingOut2TheWorld. Around midday Riri, Mawande, and Aphiwe came by to work on a few special letters we’ll be giving to our top contributors!! I couldn’t be more impressed with how well these three set to work on these letters. I know you guys will absolutely love them!! During this same time our room quickly filled up with about 12 other people. We played a big card with everyone which eventually turned into a challenge to see if Hanneke and I could stack an entire deck of cards on a bottle of Axe spray. One by one we placed a card on top with the only rule being that two corners had to be hanging off at all times. As we got closer and closer to finishing up the deck of cards we began gaining everyone’s attention. Soon enough we were adding additional items onto our stack until we thought we would push our limit. From there we included the rest of the group in a makeshift game of jenga that had us each taking turns pulling the cards off until one of us collapsed the whole structure. After dinner some of the guys were still back in the room playing a 4 person game on Dan’s ipad. Sometimes they are good at sharing but if you don’t keep an eye on them the older guys in the group sometimes hog the device. While I was working with Riri on his letter I heard a very loud slapping noise and looked up to see a fight breaking out in the room. I don’t know exactly what happened but I do know that Wande slapped Luthando across the face harder than I’ve ever seen anyone get slapped. Immediately I told Wande to leave the room and the other guys made sure Luthando was alright. I’m pretty sure this was all because of whose turn it was in the game. It’s pretty common to see such aggression with kids around here but that doesn’t mean it’s alright in my room! I later went out to talk to Wande to let him know that it’s never okay to hit someone in the face like that. Just after 8 the group dispersed and headed home. The plan was to hang out with the rest of the volunteers for our last night but I wanted to first grab a shower. While I was in the bathroom just about to step into the shower I heard someone crying outside the door. I stopped what I was doing so I could hear better what was being said. It sounded like Lupho and he was really upset about something. I figured my shower could wait a minute and I went out to see what the problem was. Back in my room Lupho was sitting on my bed with Mieke by his side. Apparently after we said our farewell a couple of the older kids beat him up just down the road. Besides being noticeably upset, he looked alright, and I think he was mostly just shook up. Dan had gone outside to see if any of the kids were still around but I don’t think any of them stayed back. I’m not sure there was an actual reason as to why he was beat up, but the easy explanation is that boys around here are just a bit more aggressive. I don’t think violent is the right term because they don’t ever seem to really want to hurt each other… they just like to hit each other. At home, children are disciplined by being hit. Often, when there is a problem, hitting each other is just their first response. When I saw Dan and Mieke had things under control and Lupho was being spoiled with gummy worms I figured I could get back to my shower. The sad truth was that Dan and I would be leaving early Monday morning and wouldn’t be able to talk to any of the kids that beat up Lupho till the end of October. By the time we get back I don’t think they’d even know what we’re talking about. Post shower we all met up in the house shared with the girls from Holland and Germany. There were 7 of us in total and we played a game called Things. To play this game someone must first read a statement like, “Name something you’d find in the trash.” All participants then write down a suitable answer and fold it up before giving it back to the reader. The reader then reads aloud all the responses and gets one guess as to who wrote what. If they are right they get another guess, if they are wrong the person to the left of them gets a guess. This continues until everyone’s response has been guessed. This is a fun game with a large group and is much harder than it may sound. Dan beat everyone fairly easy but he later told me that he was able to tell who wrote what based off of their reactions when the responses were first being read. Twas very clever Mr. Sellers. Even though the games were fun the real highlight of the night was the chocolate mousse cake which we all split. I thought the cake was delicious and the perfect way to cap off our farewell night. After a close game of hearts, which Hanneke beat me by 2 points, it was time to head back to our room and begin backing for our trip through Dubai and Morocco. The next few posts may be spread out a bit because I can’t say for sure how well I’ll have internet connection along the way. This trip may also leave little time for updating but I’ll see what I can do 🙂 Hope you Enjoy!! Categories: Reaching Out 2 The World | Tags: blog, cake, Kayamandi, o sullivan, Reaching Out 2 The World, reachingout2theworld, South Africa, Stellenbosch, Travels | Permalink. Earlier in the week Dan and I made plans to take our group of kids from Kayamandi to Muizenburg so they could check out Dave’s Surf Program. All week I’ve been excited for this! After a few minor setbacks in the morning it was finally time for us to meet up at the surf shack. Ten children and four volunteers came along for the adventure today. The children were, Mawande, Chester, Lupho, Khanyisa, Rethabile, Athabile, Ski, Apwhiwe, Luthando, and Wande. The volunteers coming along to help were Theresa, Mieke, Hanneke, and I. Out of our whole group Mieke, Hanneke, and I were the only ones who had tried surfing before… and that was about two weeks ago. I knew one thing was for sure though; these guys absolutely love the water, even the ones that can’t swim love to hang out in the water! The drive to Muizenburg took about an hour and our van was pretty crowded. The girls in the back had everyone singing everything from, “If you’re happy and you know it”, to The South African National Anthem. I felt sort of bad for our driver because of how loud we were being but he didn’t seem to mind. During our drive we drove past Khayelitsha, the biggest township in the Western Cape. This township is the home to over a million residents and is quite the sight to see. As we drove past, all the boys in the van stopped singing to check it out. None of them have ever been there before but they all know about it. The place is pretty famous for all sorts of reasons. I know about it for its size and population, while the boys know about it because several of their favorite rappers were born and raised there. At first I thought they were gawking at the township when we drove past but I think they were just awestruck by its size. The closer and closer we got to Muizenburg the darker the clouds got. I couldn’t help but wonder if the weather would hold out for us. I just kept telling myself that no matter what, we’ll make the most of our day! I also knew that the boys would be able to sport some sweet wetsuits that would hopefully provide them with the warm they needed. When we finally pulled up to Dave’s Surf Shack we were welcomed and greeted by the children involved in the surf program, as well as a few volunteers, and Bronwyn, Dave’s daughter. They were also concerned about the harsh weather conditions but had set up a few back up plans in the case we couldn’t get in the water. I convinced them that we brought some pretty tough kids with us and that once they were suited up in their wetsuits they’d be good to go. Of course none of our guys had ever worn a wetsuit before so it was pretty hilarious watching them struggle to put them on. Poor Lupho tried his absolute hardest to squeeze his body into a suit that was at least 5 sizes too small before I noticed and grabbed a larger one for him. Once the boys were ready we walked across the street to where the Surf Shop was located so the volunteers could also get ready. This was where everyone received their surf boards and the excitement started to set in. While we waited for everyone to get ready Hanneke and Mieke gathered the crew for an epic game of ninja. Playing any game in a wetsuit will improve the fun quality immensely! Down at the beach we were joined with Dave’s crew. All in all there were 23 of us ready to tear it up in the ocean, but first we had to get our lesson. We started with a run around the beach to warm up, followed by a giant group stretch. When everyone was feeling loose we began practicing laying on the boards, paddling, and the proper way to hop up onto your feet. I really didn’t expect many, if any, of our guys to grasp surfing on their first try, I was just happy that they’d get the chance to swim and play the ocean! Soon enough it was time for all of us to wade out in the water. Each kid from Kayamandi was paired with someone from Dave’s program. It was really cool to see the kids working together so well. Most of the guys Dave works with speak Afrikaans, while all of ours speak Xhosa. This didn’t seem to matter in the least bit though as they worked together to ride the waves. Because the air was so chilly the water actually felt great. I don’t think anyone was cold once we were in, but I’m sure the wetsuits played a major role in that! With such a huge group it seemed that no matter where I looked kids were readying themselves for the next wave. I can’t say for sure, but I think Khanyisa was the first to stand. Watching this was like watching your child take their first steps. I was so proud of him even though he only stood up for about a second. Riri, and Athabile were close seconds to standing on their boards. Riri was the one in our group I was most confident about that would be able to pick up surfing. I don’t think everyone in our group was able to stand up but I know they were each able to at least ride wave in boogie board style. Mawande is probably the weakest swimmer in our group and I was worried he wouldn’t be able to do much. Last week at Myoli’s beach I caught him boogie boarding in about an inch of still water. When I looked out to see him lying on his board in water that was past his waist, I was both proud and a little worried. I knew if he fell that he’d be able to stand, but the ocean has a way of tossing you around and sometimes it’s hard to find good footing. A moment later I glanced back in his direction and he was gone! I looked around in the direction I saw him last but he was nowhere to be found. It wasn’t until I turned to face the beach that I saw he had ridden a wave all the way in, and I mean ALLL the way in until he was beached! I’m pretty sure that was his most successful ride of the day but it was a darn good one! Everywhere I looked our group was getting better and better and for the hour we tore that ocean up! Getting back out of the ocean meant a cold and windy walk back to the surf shack, but our efforts were rewarded with perfectly timed hot chocolate! The Surf Shack knows how to cater! Once everyone was out of their wetsuits and into their dry clothes we had about 30 minutes before lunch. This time was spent playing with every toy the surf center had to offer. There were kids skateboarding, kicking the soccer ball around, playing ping pong, boxing, lifting weights, throwing exercise balls, and more. After some time a few of these activities morphed together into some sort of gauntlet ride for the guys brave enough to ride. Each guy took turns riding down the small hill on a skateboard while the other boys heaved the exercise balls in their direction. This reminded me of a combination between Wipeout and Gladiator. This was all fun and games but we stopped it before someone or something got hurt. Our timing worked out well because it also happened to be time for lunch! Dave’s mother prepared a warm lunch for all the boys which consisted of rice, minced meat and beans. They all seemed to love it because the food was gone before I could get a second glance at their plates. Mnandi nento was the phrase of choice and it means in Xhosa; that was very nice. After the meal the boys went back to playing soccer and riding the skateboards. I joined in with a group that was playing once bounce. It’s basically just juggling the soccer ball within the group but the ball is only allowed to bounce once in between hits. These guys can all run circles around me when it comes to soccer but it was still a good time. I think a few of Dave’s crew was impressed with the soccer skills our boys displayed. Maybe we can get them together in the future for a combined practice or scrimmage?! Actually, the next thing on our agenda was just that, a soccer game. We all headed up to the park just up the street from the surf center. By the time I got there the field and goals had already been laid out and the game was in progress. Over 20 of us split up into two teams and we played for nearly two hours. It doesn’t matter what I fill a day with, because if we include a game of soccer than there’s no doubt these boys have had an amazing day. The volunteers took turns playing and hanging out on the sidelines, I’m pretty sure the kids were better off without us, haha. Through the first game it became pretty evident that the teams were a little unfair. I mentioned it to Riri and suggested that maybe he should switch teams. Riri is also one of the best soccer players and absolutely has the best attitude when it comes to working with others. He had no problems switching over to the less skilled team and immediately went around high-fiving his new teammates. I wish more people could be as awesome as Riri, he genuinely cares more about the greater good of everyone else before himself. His name, Rethabile, actually means happy… it’s pretty spot on if you ask me! Just before 3:00 we regrouped back at the surf center for one last group picture. We all had such an amazing time, and can’t wait till the next time we can get back together. Hanneke, and Mieke will both be here for the next year. I’m hopeful that they’ll be able to take our group back to Muizenburg in the future. Thanks so much to all the volunteers and helpers at the Surf Shack for having the patience to work with us, despite the cold weather! Can’t wait to hear all about the amazing things your program does in the future!! Our ride home was much quieter than our ride there due to our successful ability to drain these hooligans of their energy. Riri was one of the three that fell asleep on the way home and unfortunately he left his cell phone in the van. It wasn’t until the van was long gone that he informed that he was missing his phone. It stinks to lose a phone, but I can’t imagine how he must have been feeling. The boy who I just described as always being happy and the life of the party was suddenly hunched over with his head in his hands, crying. I tried getting in touch with our driver but he didn’t pick up. It wasn’t until I was able to reach Dave that we were able to work something out. Dave got a hold of the drive who said he recovered the phone and would bring it by the center tomorrow. I’ll be leaving on Monday morning so I won’t be able to see to it that Riri gets his phone back, but I think Hanneke will stay in contact with Dave and make sure things work out. Good luck to all those involved! Between the kids all being tired, and the weather being a bit chilly we thought it’d be a perfect afternoon to let the guys watch a movie. Mieke and Hanneke went about setting up a make shift viewing area in their living quarters while I worked with Aphiwe on a very special letter. Categories: Reaching Out 2 The World | Tags: blog, muizenburg, o sullivan, Reaching Out 2 The World, reachingout2theworld, soccer, South Africa, Stellenbosch, surf out reach, surfing, Travels | Permalink. Thursday and Friday were both catch up days. Back home when I need to run a few errands I just get in my car and drive to the store. I can usually take care of everything I need pretty quickly. I hardly ever need to worry about what times stores are closing, and I don’t have to worry about being home before it gets dark. Over here in South Africa you have to constantly be mindful of those things. I don’t mind walking places and taking the mini buses but a simple trip into town to mail a few postcards could take over an hour. With this in mind we typically try to accomplish as much as we can each time we have to make the trip and that’s basically what Thursday and Friday were all about. After utilizing the Wi-Fi at the trust center within the township we made our way the primary school. We wanted to catch up with a couple teachers and see a few students. We didn’t stick around too long because Dan and I both had other things we had to take care of. Pam is doing well and is looking for any ideas for helping fund raise money to buy furniture for her church. From there I split up with Dan and went into town. I got really lucky and caught a ride in with Papa Zulu, while making the walk. In town I visited the bank, a couple ATMs (because the max you can withdraw is just not enough sometimes), and the post office to mail out another 7 post cards! I actually made good time on everything and was home in just over an hour. My afternoon was spent updating blogs, finalizing the pictures for the photo books, and many more post cards. It’s certainly helping to have the kids participate in writing the post cards, and they seem to still enjoy writing to you all! Please don’t be too critical with their writing, I think it’s a lot harder for them to write in English than to speak it. In the evening all the volunteers got together for another game of true colors. We’ve now played that game all the way through so if we are interested in playing again we’ll need to first come up with some new questions. After our game the group divided and went off to bed but Hanneke, Mieke, and Gesa all stayed up to learn one of my favorite 4 person games. Spades is an excellent strategy card game played with partners but you need just 4 people to play. Our first game was mostly based around teaching the other three how to play but I’m sure we’ll play again in the future! Friday wasn’t too different from Thursday with Dan and I having to take care of a few more errands. When we visited Songo today, he was there and we were able to sit down with him and talk all about his program and our thoughts on working with him. Like Dave’s Surf Program, we were both very impressed with the work Songo’s been doing and felt confident that our contributions would be received in the highest regard. Both Dave and Songo have both successfully started programs that take less privileged children off the streets and provide them with a safe environment to learn and grow. Both programs also aim to keep the participants busy and healthy by teaching them how to balance work and play. While Dave trains his guys how to surf, Songo trains his group to ride BMX. As an added bonus, both of these awesome gentlemen work directly with the schools Dan and I volunteered at. This means we’ll be able to keep tabs on how things are going and what our students have been up to. Once Dan and I return from our trip to Dubai and Morocco, we’ve set up a date where we can get all the kids together for an afternoon filled with sports (November 1st). I’m already pumped for this and will be contacting the Stellebosch Frisbee gang to see if they’d be interested in joining us. If you’re interested in visiting Songo’s website it’s www.songo.info. After our visit with Songo we went into town so we could deliver the 350 photos that we’d need printed so we could begin putting them into the photo albums. We grabbed lunch at Asta La Pasta in the meantime and ate a delicious chicken and pasta dish. When we finished eating we still had enough time to send out a few more postcards, visit an ATM, and stop by the Western Union where I’d be able to pick up a very generous donation from my friend Eartha. Thanks again Eartha! Our timing worked out pretty great because the photos had finished printing just before we walked back into the shop. Before heading back home we picked up Dan’s laundry, and ate an ice cream cone from Steers. We’ve gotten pretty good at coordinating our visits into town so that we could accomplish everything we need to in the most efficient time possible. And yes, we always make time for ice cream. Back at home we met up with the rest of the students that will be joining us on our beach trip tomorrow and wrote out another dozen post cards. We’re trying our best to get these cards done before we leave on our trip. We still have a handful more to go but I think we can do it! I’m really looking forward to taking everyone to Muizenburg for our surf outing. I’m not exactly sure what to expect because a few of the kids struggle to swim, but I’m sure Dave has something up his sleeve. speaking of sleeves, I’m curious if all our crew will be geared up in wet suits tomorrow?! Time will tell! Categories: Reaching Out 2 The World | Tags: blog, bmx, Kayamandi, o sullivan, postcards, Reaching Out 2 The World, reachingout2theworld, songo, South Africa, Stellenbosch, Travels | Permalink. There was only one plan for Sunday and that was Mzolis. Mzolis is an outdoor braai (barbeque) located in the township of Kayalitsha. This place is well known as being the place to be on Sundays. The music is great, the vibe is fun, and the food is incredible! Mieke, Hanneke, Dan and I all caught a cab to the township just before noon. When we got there the place seemed packed! There were cars and people everywhere! Most places close down on Sundays so if you’re looking for a fun place to eat, this is your spot! The first thing you do when you arrive is head to the butchery to pick out the meat your group is interested in. We picked out a few steaks and a lengthy amount of sausage. After placing your order, your next task is finding a place to sit. There were so many people that we ended up having to share a table with another group. While we waited for our food Dan and I went next door to grab some drinks. We grabbed red wine and coke, but had no glasses. Lucky for us they were also selling custom glasses out front. The glasses were created by using recycled beer and liquor bottles. I thought these were super cool but definitely not realistic for taking home. All the meat, the glasses, and the wine cost us 110 rand each. That’s a total of 11 USD and I can promise you we got our money’s worth of food and drink. Dan shared with us how good red wine and coke taste mixed together. I liked this but probably wouldn’t do it with expensive red wine. Our afternoon was certainly fun filled and I think we all had a really great time. Like I said before, this place was very crowded and unfortunately I let my guard down at just the wrong time. Our table was located near the exit so there was a constant flow of people walking past our table. At some point while I was standing up a group of people passed by me. It was during this time that I was pick-pocketed. I remember feeling something and quickly reaching down to my pocket, but it was already too late. I felt my wallet, I felt my keys and in my other pocket I felt my iphone. It took me a second to realize that I was missing my South African cellphone. My feelings were pretty mixed after this took place. I was bummed that I no longer had my SA cellphone but thrilled that they didn’t take my wallet or iphone. I would have been pretty devastated had either of the latter been taken. I have a week left in SA before departing on a trip to Dubai and Morocco, so I’m not too concerned about not having the phone. It’s a small inconvenience and if anyone needs to reach me they know they can contact Dan. Honestly, the part that I felt the worst about was that I was planning on leaving that phone with Mawande. It’s just the most basic phone you can have but it’s still a phone, and I had told him I was planning on leaving it with him. Mawande is one of my favorites over here, he’s always the most helpful, always uses his manners, and is a joy to be around. Bottom line is that he’s a really great kid and I’m sorry I’m going have to let him down. Not long after losing my phone our cab arrived to take us home. I had a fun time at Mzolis despite losing my phone. I later described to Dan how it was a “One and Done” kind of experience for me. Great times were had, but I won’t need a day like Mzolis anytime soon. The start of the new week meant Dan and I had to get down to business. We need to hold up our end of the bargain which means we have some incentives to fulfill. This meant that we needed to run a few errands in Stellenbosch. I tried using the internet café as a means for delivering the video I put together depicting a day in Lupho’s life. It’s becoming clear to me that there is no realistic way that I’ll be sending that video while in SA. Maybe next week while in Dubai I’ll have a better opportunity to send the video. I’m doing my best friends. Among other things we mailed out more postcards and purchased more postcards. I think when all is said and done the number of postcards sent will be rounding close to 100! I hope everyone else enjoys receiving these postcards as much as I know I would. Just a reminder to share your card with the world by hashtagging it #ReachingOut2TheWorld when you get it. This can be done on Instagram, Twitter, maybe Facebook, who knows… I’m hoping that I’ll be able to check all these cards out again sometime and know if ya’ll ever received them. Before heading back to Kayamandi Dan and I stopped at the Mug & Bean for a quick bite and some free Wi-Fi. Our sweet tooth got the best of us and we both ordered the smore waffle. This Belgium style waffle was loaded with chocolate, marshmallow, and ice cream. I’m sure you’ll have no problems trusting me how delicious this was. My evening was mostly spent going through pictures from our trip for the photo albums we are putting together for the guys. I’ve also been working on creating custom name cards for each of them. I’ll explain these name cards a bit better once I finish them and can take a picture of the finished work. They are coming together, but it’s a slow process and I want them to be just right for this group. The next few days will have Dan and I running all around Cape Town, fulfilling perks, meeting with a couple organizations we’re both interested in working with, visiting the school Dan worked at, and much much more. “So much to do, so little time,” it’s what will be playing in my head until all is finished. Wish us luck! Categories: Reaching Out 2 The World | Tags: blog, Kayalitsha, Kayamandi, mzolis, o sullivan, Reaching Out 2 The World, reachingout2theworld, South Africa, Stellenbosch, Travels | Permalink. After our trip with the guys, Friday was supposed to be our day off. We didn’t have any big plans besides going into Stellenbosch. Even though sleeping in was available I still ended up getting up pretty early. My body had already gotten use to our tour schedule of early mornings and long days. We grabbed a quick breakfast at Mama Zulus and headed to the trust center to first use some free Wi-Fi. My main goal was to email the video about Lupho’s day to my friend and coworker back home, Jennie. After two hours my progress bar had only moved to 5 percent and I had to give up on sending. It’s pretty difficult to send videos when internet isn’t so easy to come by. This video is also 1.7 gb so it’s going to be tough to send from anywhere. In town we both got well overdue haircuts. The lady that cut our hair was nice but a bit odd. I got the feeling she’s had a very sheltered life when she asked me what townships are like in the US. I understand that we do in fact have townships in the US but not anything remotely close to the type of townships she was referring to. Oh well, she was nice enough and did a decent job cutting our hair. Hanneke and Mieke came along for the trip and seemed to really enjoy taking part in observing our haircuts. They were trying to get me to get something crazy done all while trying to convince the stylist to let them shave our beards off. They did so with no such luck. Afterwards we grabbed a bite to eat, ran a few errands, and hopped on the next mini bus to Kayamandi. When we got home there were already a few boys at our house playing soccer. It was an alright day with sunshine fighting through the cloud filled sky. We had no plans, so we opted to climb to the top of the hill our township rested on. At first, when we asked Mawande if he could lead us he made it seem like we wouldn’t be allowed because it was the property of the neighboring wine vineyard. His biggest concern was being attacked by the guard dogs on the property. We followed him to the entrance of the farm and when we got there the first thing we saw were a few dogs. I guess he wasn’t joking when he said guard dogs! Dan and I walked ahead to make sure it was okay if we viewed the property. The man we talked to told us it’d be alright, but they’d have to remove the dogs first. Hanneke, Mieke, Dan, Mawande, Khaniysa, Lupho, Onge, and I all then proceeded through the vineyard and up the hill. It’s a pretty beautiful walk through a vineyard and the views of Kayamandi and Stellenbosch were really great! We were lucky that the weather cooperated with us and only had to deal with some wind. The walk to the top took just over a half hour but the views were nice and we had a great time taking pictures with the kids. On the way home we took the chance with a short cut we saw and found ourselves wading through a very large patch of tall flowers. It was actually kind of nice minus the rough weeds brushing up against my legs. The younger boys helped make a path for our Dutch friends while I hoisted Onge, the smallest of the group, high above the plants. Our spontaneous adventure proved to be a fun one and had us home just in time for dinner. I could smell Mama’s mashed potatoes as we strolled into her house and knew we’d be having a great dinner! In the evening we shared pictures from our trip with the kids and a few of the other volunteers. It was a nice and relaxing day. We had one more surprised planned for the boys on Saturday which would have us meeting up and leaving by 8:30 in the morning, so after our writings were finished we got an early night’s sleep. 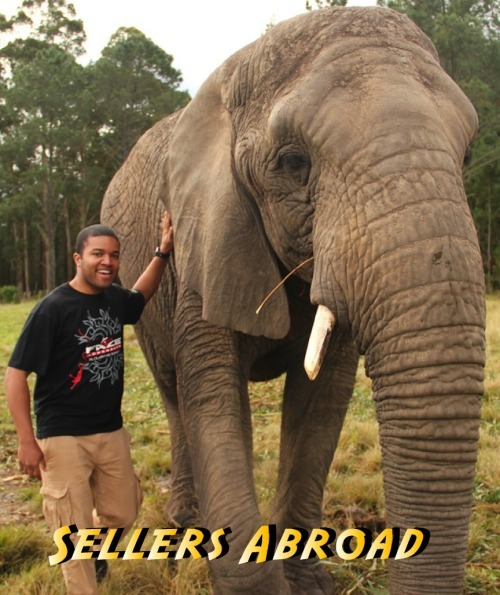 Categories: Reaching Out 2 The World | Tags: blog, hike, Kayamandi, o sullivan, Reaching Out 2 The World, reachingout2theworld, ReachingOut2TheWorld Trip, South Africa, Stellenbosch, travel | Permalink.